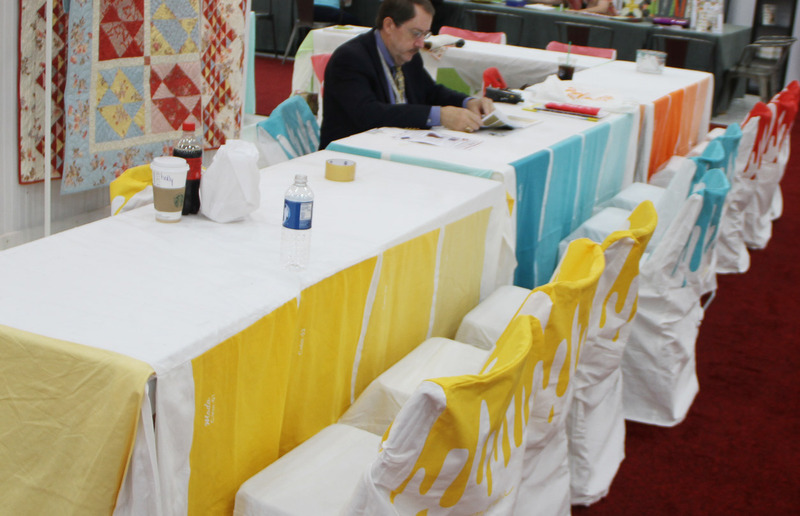 The dust has settled a bit since Quilt Market 2012 but our pride on winning the best Multiple booth continues to shine on. this year’s prize winning booth. the customers in the store. We thought that said it all. How many paint sticks did you paint? broke during the drilling process. What do you mean by drilling process? I drilled a hole in each paint stick to be able to add string and hang it from the cross beams. What colors and type of paint did you use? I used 14 colors of Valspar 8 Fl oz color samples from Lowes. Varying shades of reds, oranges, yellows, greens, blues, purple even gray. These samples are all ready mixed you just pick the colors you like and only cost a few dollars (craft paints would work just as well). Where did you get all those paint cans? Paint cans came from EmptyPaintCans.com http://www.emptypaintcans.com/. How did you put that paint drip along the edge? Placed paint in a squeeze bottle, ran a thick bead of paint around the top rim of paint can, placed paint can on a drop cloth and let paint run down sides of can. Any other details you want to share for anyone wanting to do a display using this concept? I like order so all the paint cans and sticks are in a rainbow color order. paint to mix in with the paint sticks, or hang just paint brushes. These could be fun projects for kids to do while there mothers or grandmothers are taking a quilting class. You could also have Bella solids spilling out of several paint cans. Use the drop cloth from these painting projects as a table cover or tape to the wall with painters tape to create a unique backdrop stacking paint cans and hanging stir sticks in front of. There is only 2 days to set all this up? Did you worry about making it all happen? I rehearsed it over and over in my sleep, or lack of sleep. What if I forgot something? I did have a lot of help with the set-up crew assuring me that it would be okay. They were right, it was great! The table covers and chair covers were adorable. of paint chips, tints and shades of a color. Holly has already started on the next Market preparation. The booth was amazing!! All the hard work really showed!! I didn’t get to see the real deal but what a cute idea! What a colorful post it is thank you very much for the sharing. the booth was amazing and i knew it had to take an incredible amount of work!! it was a great concept and executed perfectly! My favorite quilt in the booth was a rob peter to pay paul block in a variety of bella solids. it was featured in a little pattern book, and somehow i didn’t get home with my little book. could you email me a pdf of that? i loved the colors used in that quilt and wanted to get those colors to use in an upcoming project of my own. I capital to acknowledge you for this abundant read!! I in fact enjoyed every little bit of it and I acquire you bookmarked to analysis out the new getting you post.